Security agencies are to jointly deploy 30,000 personnel to enhance adequate security during the July 14 governorship election in Ekiti state. Caleb Ikechuckwu, the police public relations officer (PPRO) in the state, said this in Ado Ekiti, capital of Ekiti state, on Monday. According to NAN, arrangements are also in top gear to receive Ibrahim Idris, inspector general of police, on a one-day official visit to the state next week. In addition to the police, Ikechukwu listed other security and para military agencies in the pool to include Nigeria immigration service, civil defence, directorate of security services (DSS), Nigeria prisons service and the federal road safety commission (FRSC). He said contrary to expectations, none of those to be deployed for election purposes would be armed. Ikechulwu noted that since election matters were generally regarded as civil in nature, all the security agencies had been told to be civil in their approach, adding they would be at a radius of 500 metres away from every polling booth. “I can tell you proudly that the police, as a major security outfit, is more than ready,” he said. Abayomi Shogunle, assistant commissioner of police (ACP) in charge of public complaints rapid response unit, has been deployed to the state ahead of the election. Shogunle said he had the instructions of the IGP to carry out confidence building patrols in different parts of the state by attending swiftly to all complaints emanating from individuals and groups against its men. 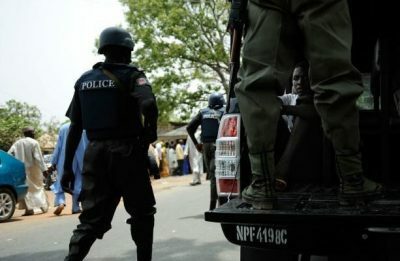 “This is one of the several measures the police authorities are taking toward ensuring that we remain neutral in the Ekiti state election,” he said. He listed emergency numbers to call for complaints including 08057000001 and 0805700002 (For calls only), 0805700003, (Gor SMS only), and 0805700003 (For Whatsapp) only. He, however, warned complainants against grave consequences of false alarms or allegations that could not be substantiated with facts. Kolapo Olusola of the Peoples Democratic Party (PDP) and Kayode Faemi of the All Progressives Congress (APC) are the two leading candidates in the election.